By creating a new twist on fiber optic sensors, researchers in China have developed a smart, flexible photoacoustic imaging technique that may have potential applications in wearable devices, instrumentation and medical diagnostics. Lead researcher Long Jin from the Institute of Photonics Technology at Jinan University in Guangzhou will present the new fiber laser-based ultrasound sensor at the OSA Frontiers in Optics + Laser Science APS/DLS conference, being held 16-20 Sept., 2018 in Washington, D.C. Jin will also present the results of a study using an in vivo photoacoustic microscope. The presentation will be part of the “Advanced Microscopy” session, to be held at 2:30 p.m. on Monday, 17 September in the Jefferson West ballroom of the Washington Hilton hotel. Their new technique relies on optical fiber technology to provide new sensors for photoacoustic imaging. It uses fiber-optic ultrasound detection, exploiting the acoustic effects on laser pulses via the thermoelastic effect -- temperature changes that occur as a result of the elastic strain. “Conventional fiber optic sensors detect extremely weak signals by taking advantage of their high sensitivity via phase measurement,” said Jin. These same sorts of sensors are used in military applications to detect low-frequency (kilohertz) acoustic waves. But it turns out that they don’t work so well for ultrasound waves at the megahertz frequencies used for medical purposes because ultrasound waves typically propagate as spherical waves and have a very limited interaction length with optical fibers. The new sensors were specifically developed for medical imaging, Jin said, and can provide better sensitivity than the piezoelectric transducers in use today. This fiber then gets doped with ytterbium and erbium to provide sufficient optical gain at 1,530 nanometers. They use a 980-nanometer semiconductor laser as the pump laser. “Such fiber lasers with a kilohertz-order linewidth -- the width of the optical spectrum -- can be exploited as sensors because they offer a high signal-to-noise ratio,” said research team member Yizhi Liang, an assistant professor at the Institute of Photonics Technology. The ultrasound detection benefits from the combined technique because side-incident ultrasound waves deform the fiber, modulating the lasing frequency. “By detecting the frequency shift, we can reconstruct the acoustic waveform,” Liang said. The team does not demodulate the ultrasound signal, extracting the original information, using conventional interferometry-based methods or any additive frequency locking. Rather, they use another method, called "self-heterodyning," where the result of mixing two frequencies is detected. Here, they measure the radio frequency-domain beat note given by two orthogonal polarization modes of the fiber cavity. This demodulation also intrinsically guarantees a stable signal output. 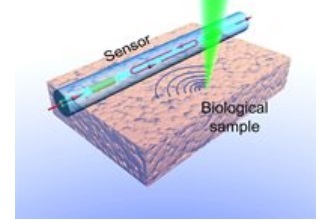 The fiber laser-based ultrasound sensors offer opportunities for use in photoacoustic microscopy. The researchers used a focused 532-nanometer nanosecond pulse laser to illuminate a sample and excite ultrasound signals. They place a sensor in a stationary position near the biological sample to detect optically induced ultrasound waves. Optical fibers are useful because they are tiny, lightweight, and intrinsically flexible, Jin added. science of light. Through world-renowned publications, meetings and membership initiatives, OSA provides quality research, inspired interactions and dedicated resources for its extensive global network of optics and photonics experts. For more information, visit osa.org.